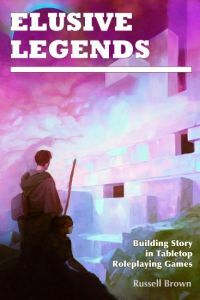 Elusive Legends: Building Story in Tabletop RPGs by Diceless Hero Games is a series of articles concerning different story writing techniques for use in role-playing games. It is aimed at Game Masters who want to improve their craft. For USD $2.99 (aff) you'll get a PDF treatise on 22 writing concepts. The product starts with the premise that being a better story writer makes a better GM. As Justin Alexander already has pointed out, there are dangers of using linear mediums as RPG examples but role-playing games traditionally have been inspired by fiction writing. As there are similarities, it doesn't hurt to begin with this assumption and as a theoretical model it is a good starting point. I also find the author's notion that the GM creates a story misleading. It sounds like a GM telling a story where the players are only spectators without influence on the outcome. This smells like railroading (gasp!) to me. Ideally, the GM and the players create a story collaboratively which means that the result is not in the GM's hand alone. Luckily, this is what Elusive Legends tries to help us with but the description of the product is a bit confusing. The goal of the book is to provide us with guidelines on how to create a story. The author, Russell Brown, approaches the topic by discussing story elements for beginners of fiction writing and suggesting ways to adjust it for RPGs. He takes four game systems as a baseline: Dungeons & Dragons, Hillfolk, Dungeon World and Fate. Herein lies the problem that I have with this product: The following articles explain how these games already use the described concepts or how they can be adjusted for use with them. That means, in order to really understand what the book is talking about, you need to know these four game systems. While I am really familiar with D&D and Dungeon World and have at least a cursory knowledge of Fate I don't know anything about Hillfolk. So every time the book talks about the concepts regarding Hillfolk I'm left out. Without prior knowledge of the aforementioned rulesets, the articles stay theoretical and thus inaccessible to me. It's nice to read how Hillfolk handles things, but it doesn't help me. Partly I'm feeling that the author approaches D&D somewhat one-sided. D&D is capable of a diverse playstyle and he sometimes seems to take the standard approach of "kill them and take their stuff" for granted. Admittedly, the rules as written may indicate that but I still feel it's a limited view. The 22 concepts are substantially explained. The author doesn't waste your time by lengthy explanations but still manages to convey the important points. If you're like me and didn't know about story elements this book offers a wealth of information. It is delivered in a tight package and is easy to read. The content makes this product worth the investment despite its shortcomings. What are the concepts exactly? I'll give you an example: the Inciting Incident. That's what sets the story in motion, where everything begins. The author explains that the incident should happen very early so that gameplay can move on. In roleplaying games, the inciting incidents refers to the moment when the players com in. And we will all agree that this should happen pretty fast, otherwise it'll get boring. Furthermore, the incident should motivate the players to get involved. The advice given for the four game systems is a mix of explanations on how these games handle certain story elements and actual examples. It is very general. I would have liked more detailed descriptions and some more illustrations on how to take the information to the gaming table. For all that, Russell Brown included a short segment about how to begin with the most important concepts. While on the short side it is a valuable tip on how to approach this book. In the end, I feel that the author doesn't deliver on his promise of providing guidelines for creating stories. He gave me a set of ideas whereas I'm a bit stumped about the actual implementation of those. The PDF has 57 pages total including cover and bibliography. The cover looks good. Interior illustrations are almost non-existent but are not necessary anyway. The layout is minimalistic but sufficient for an article series. I'm missing hyperlinks and electronic bookmarks in this document. Elusive Legends delivers a nicely written package of useful tools for story-writing. The look at four distinctive game systems and how they incorporate the story-writing concepts is fascinating. Unfortunately, the advice on how to put theory into practice is mostly not tangential enough to be of immediate use. If you don't know every game mentioned some parts of the book won't be helpful. The author has a concise writing style which I like a lot. The product is a steal for 3 bucks considering what you can learn from it. Still, the guidance on how to apply the theoretical concepts into role-playing games could be more extensive. I would've also liked to see more examples for other gaming systems and other genres. D&D and Dungeon World use a fantasy setting while Fate and Hillfolk are genre-neutral. That being said, I recommend it if you're interested in some theoretical concepts and ideas.